Despite their residence in a special playlist, and status as the game’s most time-efficient means of acquiring loot, it’s fair to say that the original Destiny’s strikes didn’t stand out to a staggering degree from its campaign missions. An expected standard of length and difficulty (and guaranteed boss) aside, they weren’t that distinct. That’s all going to change in Destiny 2, according to Bungie’s Justin Truman. 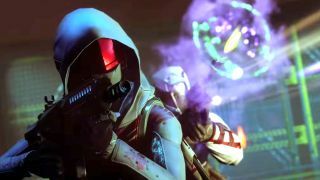 Speaking to us at Gamescom 2017, Truman explains that the two styles of PvE mission are getting rather different treatments, philosophically, in Destiny 2. “I think that when we build the strikes what we’re really trying to do is tell a self-contained story about an interesting character, usually an interesting villain, and build a really awesome combat experience that’s infinitely repayable. We focus more on spectacle and storytelling in the campaign, whereas in the Strike we focus on what is the best combat set-pieces that we can build that you’re going to want to play 20, 30, 40 times over the span of years. I feel like it’s allowed us to really double down on making sure that the strikes serve their purpose, the story serves its purpose, and exploration too”. That bodes very well indeed, not just for the strikes, which sound much more curated and specific in their focus now, but in regard to Destiny 2’s story campaign as well. Although it plays really, really well, and delivers enough background lore and big-picture storytelling to pull the player through, the original game’s narrative campaign lacks a really powerful, immediate, cinematic through-line compared to, say, Bungie’s work on Halo. This time around though, it sounds like all pillars of the game are being designed with very clear and specific intent to excel in their own direction. From what we’ve seen of the game’s sumptuously paced, relentlessly dramatic opening mission in the Destiny 2 beta – which, in terms of marrying action, narrative, and character, operates on a level never seen in the first game - the results seem to be fruitful indeed.